Constitutional recognition is not a symbolic process, but a means to engage with fellow Tasmanians in shaping our future. One of the first outcomes of recognition has been the direction of the Macquarie Point development plan to incorporate a space for Aboriginal history, culture and heritage. 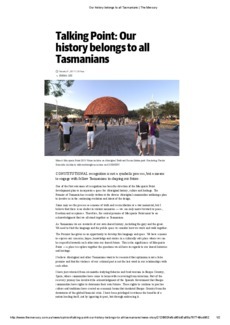 The Premier of Tasmania has recently written to the diverse Aboriginal communities outlining a plan to involve us in the continuing evolution and intent of the design. Some may see the process as a means of truth and reconciliation or a war memorial, but I believe that there is no shelter in violent memories - we can only move forward to peace, freedom and acceptance. Therefore, the central premise of Macquarie Point must be an acknowledgment that we all stand together as Tasmanians.